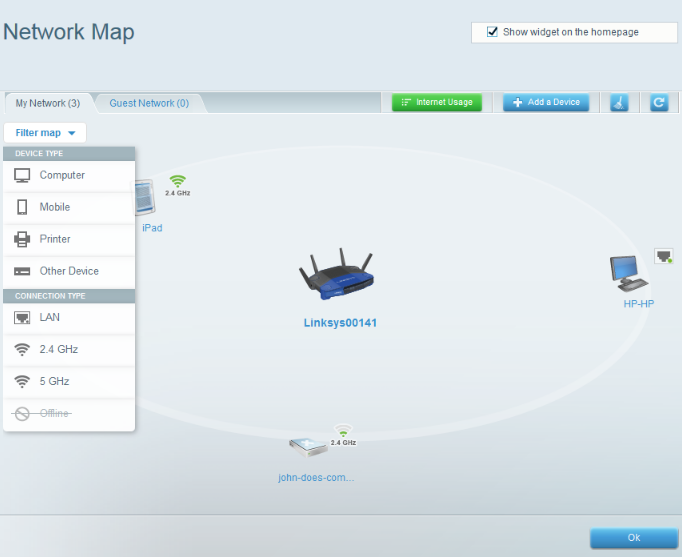 The Network Map Tool of your Linksys Smart Wi-Fi Router allows you to manage and monitor your devices’ connectivity to the network. In this page, you will be able to see online and offline devices that are connected to the router. Also, you have the option to view devices either by CONNECTION TYPE or DEVICE TYPE. QUICK TIP: Online means the device is turned ON and is currently connected to the network. Offline means the device is turned OFF and is not connected to the network. Devices that were previously connected to the router would still be displayed in the Network Map even when they are powered OFF. If your router supports it, you can either click on the Clear Network Map icon or the Refresh icon to update the list of status and devices. Clicking the Clear Network Map will reboot the router to apply the settings. To locate the Network Map, access your router’s web-based setup page. Under Smart Wi-Fi Tools, click Network Map. There are two (2) categories in the Network Map section: My Network and Guest Network. By clicking on the Filter map drop-down menu, you can view the devices by group. Listed below are the categories available. QUICK TIP: The older Linksys Smart Wi-Fi Routers have the Device List Tool instead of the Network Map Tool. To learn more about this feature, click here. Clicking on a specific device on the map, then selecting Device Info will display the details such as its Name, Manufacturer, Model, OS, IP Addresses and MAC Address. To learn about changing the name or icon of a device, click here. NOTE: Switches and other passive devices are not required to be detected in the Network Map page. The Internet Usage section of the Network Map Tool allows you to check the Internet bandwidth used by each device connected to your router. To view this section, click the button. NOTE: The Internet Usage button is available on routers that support this option. Total Bandwidth – Displays the total transfer data rate or bandwidth consumption of connected devices. Transmit – Displays the amount of data uploaded. Receive – Displays the amount of data downloaded. NOTE: For example, the image below shows that the Linksys-iPhone device has consumed 1.23Mbps of total bandwidth. – This option is for a device that uses Wi-Fi Protected Setup™ (WPS) to connect wirelessly to the network. If your device has a WPS logo on it, then it supports WPS connectivity. If you want to use this feature, click here for instructions. – Select this option if you want a wireless device such as a camera, smartphone, gaming console, wireless printer, or any other device to connect wirelessly to a router. To start connecting wireless devices to your router, click here for step-by-step instructions. – Choose this option if you want to connect a standard USB printer to your network for your clients to share. The printer must be connected to the USB port of the router via a USB cable. NOTE: If your printer has wireless capability, you can connect it as a wireless client using the Other or WPS option. Click here for instructions on how to connect a USB printer on Mac®, and click here for a Windows® computer. QUICK TIP: You can also rename and delete devices that are in the Network Map Tool. To know more about managing your devices using the Network Map Tool, click here. If you want to connect a guest device temporarily, you can use the Guest Access Tool. It allows Internet access for guests in your home, but also restricts access to your personal devices such as printers and shared drives. For an overview on this Tool, click here.